My oldest niece, who is now 12, requested a hat and fingerless mitt set for her birthday (which was at the end of March). Now that she has received her gift, I can share it with you. I loved how the hat turned out. 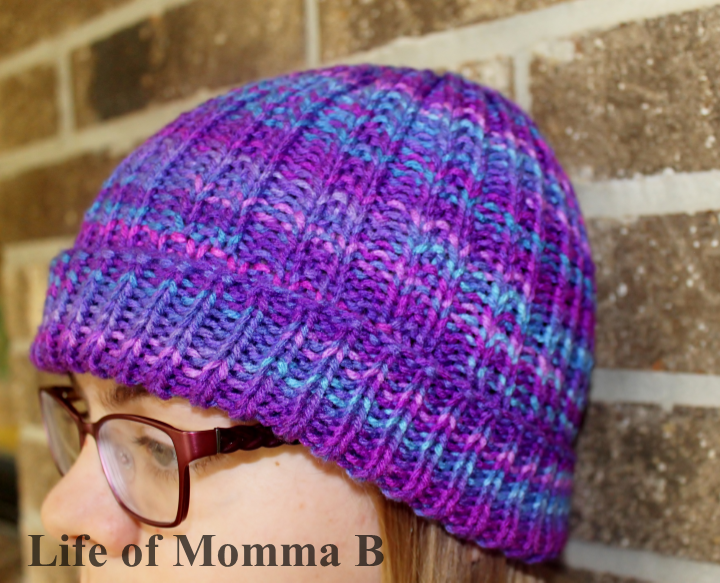 The brim is made of a simple 1×1 rib stitch that is folded up. The body of the hat is a modified rib, creating a lovely textured pattern that carries all the way up to the top through the decrease. The hat was made from a free pattern I found at Knit Spirit. It is also available in French, if you are so inclined. The only drawback I see to the pattern is that I was not able to print it. But, it was easy enough to be able to write in on a piece of paper and carry with me as I knitted. This entry was posted in Knitting and tagged free pattern, hat, matching set. Bookmark the permalink.